Statistics current as of December 20, 2012. Dale Arnold Jarrett (born November 26, 1956) is a former American race car driver and current sports commentator known for winning the Daytona 500 three times (in 1993, 1996, and 2000) and winning the NASCAR Winston Cup Series championship in 1999. He is the son of 2-time Grand National Champion Ned Jarrett, younger brother of Glenn Jarrett, father of former driver Jason Jarrett, and cousin of Todd Jarrett. In 2007, Jarrett joined the ESPN/ABC broadcasting team as an announcer in select Nationwide Series races. In 2008, after retiring from driving following the 2008 Food City 500, he joined ESPN permanently as the lead racing analyst replacing Rusty Wallace. In 2015, Jarrett became a part of the NBC Sports Broadcasting Crew for NASCAR events. He was inducted in the 2014 class of the NASCAR Hall of Fame. Jarrett was born on November 26, 1956 in Conover, North Carolina, the middle child of Ned and Martha. Jarrett has an older brother, Glenn; and a younger sister, Patti. Jarrett's father Ned competed in the NASCAR Grand National Division between 1953 to 1966, winning two series championships in 1961 and 1965. Following retirement, Ned remained active in the racing community as manager of Hickory Motor Speedway and later established a career in broadcasting. Jarrett spent his childhood traveling to his father's races across the Southern United States. He was introduced to golf by age twelve; he also played football, basketball and baseball while attending Newton-Conover High School. Jarrett led his high school's golf team to three conference championships, and was named the school's athlete of the year as a senior. Following graduation in 1975, Jarrett worked at Hickory Motor Speedway, the track his father managed. Jarrett was offered a full golf scholarship from the University of South Carolina, which he declined. Though he continued to play golf, Jarrett was interested in following his father's footsteps as a racing driver. In April 1977, Jarrett entered his first professional race in the Limited Sportsman Division at Hickory. His vehicle, a 1968 Chevrolet Nova, was built by Andy Petree and Jimmy Newsome. Jarrett started last and finished in ninth place; it was after this event when Jarrett knew that he wanted to race for a living. Jarrett continued to compete in the Limited Sportsman Division for two years, before moving up to the Dash Series and then the Late Model Sportsman Division, the latter in which he earned his first victory. Jarrett competed in the 1982 NASCAR Budweiser Late Model Sportsman Series for car owner Horace Isenhower. He earned fourteen top-10 finishes throughout the season, with a best of third place at Hickory; and he finished sixth in the point standings. During the 1983 season, Jarrett won four poles and earned seventeen top-5s, finishing fifth in the point standings. For the 1984 Busch Grand National Series, Jarrett received sponsorship from Econo Lodge; Valvoline; and Budweiser. He earned six front-row starts and nineteen top-10s, finishing a career-best fourth in the point standings. Jarrett made his Winston Cup Series debut during the 1984 season. Driving the No. 02 Chevrolet for Emanuel Zervakis at Martinsville Speedway, Jarrett qualified twenty-fourth and finished fourteenth. He made two more Cup starts that season, at the Firecracker 400 for Jimmy Means, and the Warner W. Hodgdon American 500. During the 1986 Busch Grand National Series, Jarrett earned his first career victory at Orange County Speedway in Rougemont, North Carolina; piloting the Nationwise Auto Parts Pontiac to victory lane. He also earned six poles in 1986. Jarrett earned his second career victory in the Busch Grand National Series at Hickory during the 1987 season. In the Winston Cup Series, Jarrett replaced Tommy Ellis in the No. 18 Chevrolet owned by Eric Freelander early in the season. Running a primarily-unsponsored car, he had two 10th-place finishes and ended the season 26th in points, second to Davey Allison for Rookie of the Year honors. He ran every race of the 1988 season, despite running with various teams. He made most of his starts in the No. 29 Hardee's-sponsored Oldsmobile owned by Cale Yarborough, finishing eighth at Riverside International Raceway. He also ran races for Buddy Arrington and Hoss Ellington that season, finishing 23rd in the final standings. He ran the entire season for Yarborough in 1989, posting five Top 10 finishes, including two fifth-place runs. Jarrett enjoyed the majority of his success in the Busch Series during the 1990 and 1991 seasons. Led by crew chief John Ervin and engine builder Ron Hutter, Jarrett scored victories at Bristol, Charlotte, Rockingham and Darlington (twice). Jarrett began 1990 without a Cup ride before taking over the No. 21 Citgo-sponsored Ford Thunderbird for Wood Brothers Racing at the Valleydale Meats 500, replacing the injured Neil Bonnett. He finished in the Top 10 seven times during the season and finished 25th in the final standings despite missing the first five races of the season. The following season, Jarrett won his first career Winston Cup race at Michigan International Speedway, and finished a then career-best 17th in the final standings. Despite the win, Jarrett left Wood Brothers to drive the No. 18 Interstate Batteries-sponsored Chevrolet for the fledgling Joe Gibbs Racing team. In their first year of competition, Jarrett had two Top 5s but dropped to 19th in points. In 1993, Jarrett won the Daytona 500 after battling Dale Earnhardt (commonly referred to as "The Dale and Dale Show"). While Jarrett did not win again that season, he had a total of 13 Top 5s and finished fourth in the final standings. During the spring race at Bristol, Jarrett threw his helmet at the No. 90 car of Bobby Hillin Jr. who crashed Jarrett while he had been lapped. The next season, Jarrett won the Mello Yello 500, but chose to step down from the Gibbs organization at the end of the season. Jarrett signed to drive for Robert Yates in 1995, piloting the No. 28 Texaco-sponsored Ford in place of an injured Ernie Irvan at the Winston Cup level. His Busch Series team also made the switch to Ford as well. With engines provided by Yates and sponsorship from Mac Tools, Jarrett scored four Busch Series wins during the season. However, only three of the wins counted. His win at Michigan was disqualified due to an unapproved engine part. He won his first Cup race for Yates at Pocono Raceway and finished 13th in the final standings. When it was announced Irvan (who had returned toward the end of the year in a Texaco Havoline-sponsored Yates car numbered 88) would return to the 28 after a year-long absence due to injuries, Yates had planned to help Jarrett compete in his own team with Hooters sponsorship. The deal fell through, however, and Yates promoted the 88 car to full-time in the Winston Cup Series with Ford assuming sponsorship through its Quality Care Service and Ford Credit divisions. In 1996, Jarrett won the Daytona 500 for a second time, and finished in the Top 2 in each of the first three races of the season. He also won the Coca-Cola 600, Brickyard 400, and 2nd Michigan race. Jarrett finished third in the final point standings behind Hendrick Motorsports teammates Terry Labonte and Jeff Gordon. Jarrett's kissing of the bricks at Indianapolis started a tradition that has been used by every NASCAR team at the race since then and in the Indianapolis 500 since 2003. The following season, he won a career-best seven races but lost the championship to Jeff Gordon by fourteen points, who by Jarrett's own admission on August 25, 2012, was "eleven hundred times the driver I ever dreamed of being". In 1998, Jarrett won three races, and finished second in the last two races of the year, ending up third in the final point standings to Jeff Gordon, despite suffering gallbladder problems, which made him miss the exhibition race in Japan. After an offseason surgery, Jarrett returned in 1999 and took the points lead after his first win of the season at the Pontiac Excitement 400 and held it for the rest of the season, when he won The Winston Cup title by 201 points over Bobby Labonte with four wins - Richmond, Michigan, Daytona, and Indianapolis. He also retired from the Busch Series to become a part-time owner, partnering with National Football League quarterback Brett Favre to field the No. 11 Rayovac-sponsored Ford for his son Jason, Yates teammate Kenny Irwin, Jr., and Steve Grissom. He had 11 wins in the Busch Series when he retired. Following his title in 1999, Jarrett won the Daytona 500 for the third time in 2000 but after only winning one other race and dropping to fourth in the standings, Ford elected to withdraw as the primary sponsor (although Ford Credit remained as the secondary). United Parcel Service (UPS) was signed as the primary sponsor for Jarrett and shortly thereafter, UPS began a multi-year promotional campaign involving the company trying to convince him to drive their trademark "Big Brown Truck" in a race. In 2001, he won three of the first eight races of the season (Darlington, Texas, and Martinsville) and resumed the points lead (trading it with Jeff Gordon, with the two of them having the same point totals for a few different weeks) but won only one more time over the course of the year and faded back to fifth in the standings. This was a good and bad year for Jarrett; the good thing was that he won four races (New Hampshire was the fourth win in July) with the bad part being the fact that he suffered a hard crash and a minor concussion at the new Kansas Speedway. In an interview, Jarrett said that he did remember not being in the Protection One 400 but only getting on the plane to go to the racetrack. After that season, Jarrett's long-time crew chief Todd Parrott departed and Jimmy Elledge took over the role as a replacement. After seven races of the 2002 season, Jarrett and Parrott reunited, and Jarrett went on to clinch two victories (Pocono and Michigan) and rebounded to ninth in the final standings after the poor start to the year. Jarrett began the 2003 season by winning at North Carolina Speedway but only posted five more Top 10 finishes, relegating him to 26th in the final standings. He rebounded in 2004 to finish 15th in points, despite not winning a race for the first time since 1992. In 2005, Jarrett had an up-and-down year in 2005; In the Busch Series Bristol race, he was involved in a crash with Shane Hmiel. When Jarrett confronted him under a red flag, Hmiel flipped him off drawing a fine from NASCAR. Jarrett was not penalized for any part he had in the wreck. Later, Jarrett got his last career Cup series win at Talladega Superspeedway, again finishing 15th in the standings. During the 2006 season, Jarrett had four Top 10 finishes, with a best finish of 4th at Kansas. His best starting position was 2nd and he finished 23rd in points. It was his last year racing for Yates, as he and his sponsor UPS left for Michael Waltrip Racing's new No. 44 Toyota team. Jarrett started the 2007 Nextel Cup season on a high note as he drew pole position for the annual exhibition race, the Budweiser Shootout, at Daytona. He finished 18th out of 21 cars. 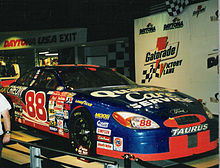 Since Jarrett's team was a brand new team and had no owner points, and due to a rule change, he was eligible to use the Past Champion's Provisional five times as his 1999 championship was the most recent among past champions who were driving for teams not in the top 35 in owner points; prior to the rule change the use of a Past Champion's Provisional was not limited. Jarrett was forced to use all five of his provisionals at the start of the season, starting at Daytona mainly because Michael Waltrip Racing was penalized by NASCAR for an illegal fuel additive during Speedweeks and the penalties knocked Jarrett, Waltrip and Reutimann out of the Top 35 in owner points-the safety net for qualifying regardless of rain and cancellations of qualifying. Jarrett started 43rd in the Daytona 500 and finished 22nd. Jarrett used his last champion's provisional at the spring Talladega race, Aaron's 499. For the rest of 2007, Jarrett had to get into that weekend's race on time. Jarrett missed 11 races in 2007 as a result. During an interview on Speed, Jarrett said after his contract is up with MWR (which was expected to be in the 2009 season), he would retire, but the timetable was pushed up in October 2007 prior to the 2007 Bank of America 500. Jarrett retired from points racing after the 2008 Food City 500, turning the No. 44 Toyota ride to David Reutimann. His final race was the All-Star race in May, 2008 after which he joined ESPN's NASCAR coverage full-time as a booth announcer. Enjoy this. We all have our time in this, and mine has been fantastic. To me, it has been an honor and a privilege to be able to race in this series and say I raced with and against and sometimes beat the best in the world. Thanks for allowing me to do that. Enjoy it. It's a great sport, and you guys make it what it is. Jarrett's brother-in-law is Jimmy Makar who was his crew chief when he drove the 18 car for Joe Gibbs Racing, he is married to Dale's sister Patty. Jarrett is an avid golfer and has a 2 handicap in golf and in 2003 was once featured in a commercial with Phil Mickelson, Michael Jordan and Wayne Gretzky where they were golfing at Doral Golf Resort & Spa. Jarrett is featured in commercials where he is persuaded to race the UPS Truck, in recent commercials he is featured with father Ned, in one commercial and in others he is trying out the features of the truck. In NASCAR 06: Total Team Control, the Big Brown Truck is unlockable as a paintjob for Jarrett. Jarrett was a member of the Coca-Cola Racing Family of Drivers when he raced. Jarrett was featured in a commercial with Jackie Stewart as Jarrett's "mentor". Jarrett is the first cousin of USPSA/IPSC Champion Handgun Shooter, Todd Jarrett. Jarrett and former American football quarterback Brett Favre are co-owners of the Dale Jarrett Racing Adventure and Favre was a part owner of Jarrett's Busch Series team. Jarrett used to own and operate a Ford dealership in Indian Trail, North Carolina, southeast of Charlotte. He sold it to Crossroads Automotive Group and it became Crossroads Ford of Indian Trail. Jarrett now lives in Hickory, North Carolina. Jarrett participated in the Olympic Torch Relay in the 2002 Winter Olympics in Salt Lake City. Jarrett's son, Zach, is a professional baseball outfielder in the Baltimore Orioles organization, currently playing for the Delmarva Shorebirds. ^ Bonkowski, Jerry (26 January 2015). "NASCAR Hall of Famer Dale Jarrett to join NASCAR coverage on NBC, NBCSN". ^ a b c Moriarty 2001, p. 22. ^ a b Moriarty 2001, p. 19. ^ Moriarty 2001, p. 14-19. ^ Moriarty 2001, p. 17. ^ a b Moriarty 2001, p. 24. ^ a b c Moriarty 2001, p. 25. ^ Schneider, Kristen (April 1, 2015). "NASCAR Hall of Famer Dale Jarrett reflects on career, golf scholarship from South Carolina". The Daily Gamecock. Retrieved March 29, 2016. ^ Moriarty 2001, p. 25-26. ^ a b c d e f "Atlanta Dale Jarrett On First Week as Champion". Motorsport.com. November 19, 1999. Retrieved March 29, 2016. ^ Moriarty 2001, p. 26. ^ a b c Moriarty 2001, p. 27. ^ a b Moriarty 2001, p. 28. ^ Moriarty 2001, p. 29. ^ "Driver Dale Jarrett Career Statistics - Racing-Reference.info". ^ "John Ervin Crew Chief Statistics - Racing-Reference.info". ^ Press, Associated (20 August 1995). "Upon Review, Martin Wins When Jarrett Is Disqualified" – via LA Times. ^ "Jarrett Retires After 24 Years". Tampa Tribune. 2008-03-16. Archived from the original on 2008-04-10. Retrieved 2008-03-17. ^ "Richard Petty Driver of the Year". National Motorsports Press Association. Retrieved April 3, 2016. ^ "Honoring 50 Greatest Drivers". Motorsport.com. February 13, 1998. Retrieved April 3, 2016. ^ "All-Time ESPY Winners". ESPN MediaZone. June 24, 2010. Retrieved April 3, 2016. ^ "Meet the Inductees - 2014". NASCAR Hall of Fame. Retrieved April 3, 2016. ^ "Dale Jarrett – 1984 NASCAR Winston Cup Results". Racing-Reference. Retrieved August 14, 2017. ^ "Dale Jarrett – 1986 NASCAR Winston Cup Results". Racing-Reference. Retrieved August 14, 2017. ^ "Dale Jarrett – 1987 NASCAR Winston Cup Results". Racing-Reference. Retrieved August 14, 2017. ^ "Dale Jarrett – 1988 NASCAR Winston Cup Results". Racing-Reference. Retrieved August 14, 2017. ^ "Dale Jarrett – 1989 NASCAR Winston Cup Results". Racing-Reference. Retrieved August 14, 2017. ^ "Dale Jarrett – 1990 NASCAR Winston Cup Results". Racing-Reference. Retrieved August 14, 2017. ^ "Dale Jarrett – 1991 NASCAR Winston Cup Results". Racing-Reference. Retrieved August 14, 2017. ^ "Dale Jarrett – 1992 NASCAR Winston Cup Results". Racing-Reference. Retrieved August 14, 2017. ^ "Dale Jarrett – 1993 NASCAR Winston Cup Results". Racing-Reference. Retrieved August 14, 2017. ^ "Dale Jarrett – 1994 NASCAR Winston Cup Results". Racing-Reference. Retrieved August 14, 2017. ^ "Dale Jarrett – 1995 NASCAR Winston Cup Results". Racing-Reference. Retrieved August 14, 2017. ^ "Dale Jarrett – 1996 NASCAR Winston Cup Results". Racing-Reference. Retrieved August 14, 2017. ^ "Dale Jarrett – 1997 NASCAR Winston Cup Results". Racing-Reference. Retrieved August 14, 2017. ^ "Dale Jarrett – 1998 NASCAR Winston Cup Results". Racing-Reference. Retrieved August 14, 2017. ^ "Dale Jarrett – 1999 NASCAR Winston Cup Results". Racing-Reference. Retrieved August 14, 2017. ^ "Dale Jarrett – 2000 NASCAR Winston Cup Results". Racing-Reference. Retrieved August 14, 2017. ^ "Dale Jarrett – 2001 NASCAR Winston Cup Results". Racing-Reference. Retrieved August 14, 2017. ^ "Dale Jarrett – 2002 NASCAR Winston Cup Results". Racing-Reference. Retrieved August 14, 2017. ^ "Dale Jarrett – 2003 NASCAR Winston Cup Results". Racing-Reference. Retrieved August 14, 2017. ^ "Dale Jarrett – 2004 NASCAR Nextel Cup Results". Racing-Reference. Retrieved August 14, 2017. ^ "Dale Jarrett – 2005 NASCAR Nextel Cup Results". Racing-Reference. Retrieved August 14, 2017. ^ "Dale Jarrett – 2006 NASCAR Nextel Cup Results". Racing-Reference. Retrieved August 14, 2017. ^ "Dale Jarrett – 2007 NASCAR Nextel Cup Results". Racing-Reference. Retrieved August 14, 2017. ^ "Dale Jarrett – 2008 NASCAR Sprint Cup Results". Racing-Reference. Retrieved August 14, 2017. ^ "Dale Jarrett – 1982 NASCAR Budweiser Late Model Sportsman Series Results". Racing-Reference. Retrieved August 16, 2017. ^ "Dale Jarrett – 1983 NASCAR Budweiser Late Model Sportsman Series Results". Racing-Reference. Retrieved August 16, 2017. ^ "Dale Jarrett – 1984 NASCAR Busch Grand National Series Results". Racing-Reference. Retrieved August 16, 2017. ^ "Dale Jarrett – 1985 NASCAR Busch Grand National Series Results". Racing-Reference. Retrieved August 16, 2017. ^ "Dale Jarrett – 1986 NASCAR Busch Grand National Series Results". Racing-Reference. Retrieved August 16, 2017. ^ "Dale Jarrett – 1987 NASCAR Busch Grand National Series Results". Racing-Reference. Retrieved August 16, 2017. ^ "Dale Jarrett – 1988 NASCAR Busch Grand National Series Results". Racing-Reference. Retrieved August 16, 2017. ^ "Dale Jarrett – 1989 NASCAR Busch Grand National Series Results". Racing-Reference. Retrieved August 16, 2017. ^ "Dale Jarrett – 1990 NASCAR Busch Grand National Series Results". Racing-Reference. Retrieved August 16, 2017. ^ "Dale Jarrett – 1991 NASCAR Busch Grand National Series Results". Racing-Reference. Retrieved August 16, 2017. ^ "Dale Jarrett – 1992 NASCAR Busch Grand National Series Results". Racing-Reference. Retrieved August 16, 2017. ^ "Dale Jarrett – 1993 NASCAR Busch Grand National Series Results". Racing-Reference. Retrieved August 16, 2017. ^ "Dale Jarrett – 1994 NASCAR Busch Grand National Series Results". Racing-Reference. Retrieved August 16, 2017. ^ "Dale Jarrett – 1995 NASCAR Busch Grand National Series Results". Racing-Reference. Retrieved August 16, 2017. ^ "Dale Jarrett – 1996 NASCAR Busch Grand National Series Results". Racing-Reference. Retrieved August 16, 2017. ^ "Dale Jarrett – 1997 NASCAR Busch Grand National Series Results". Racing-Reference. Retrieved August 16, 2017. ^ "Dale Jarrett – 1998 NASCAR Busch Grand National Series Results". Racing-Reference. Retrieved August 16, 2017. ^ "Dale Jarrett – 1999 NASCAR Busch Grand National Series Results". Racing-Reference. Retrieved August 16, 2017. ^ "Dale Jarrett – 2005 NASCAR Busch Series Results". Racing-Reference. Retrieved August 16, 2017. ^ "Dale Jarrett – 2007 NASCAR Busch Series Results". Racing-Reference. Retrieved August 16, 2017. ^ "Dale Jarrett – 1985 ARCA Talladega SuperCar Series Results". Racing-Reference. Retrieved August 16, 2017. ^ "Dale Jarrett – 1994 IROC Results". Racing-Reference. Retrieved August 16, 2017. ^ "Dale Jarrett – 1996 IROC Results". Racing-Reference. Retrieved August 16, 2017. ^ "Dale Jarrett – 1997 IROC Results". Racing-Reference. Retrieved August 16, 2017. ^ "Dale Jarrett – 1998 IROC Results". Racing-Reference. Retrieved August 16, 2017. ^ "Dale Jarrett – 1999 IROC Results". Racing-Reference. Retrieved August 16, 2017. ^ "Dale Jarrett – 2000 IROC Results". Racing-Reference. Retrieved August 16, 2017. ^ "Dale Jarrett – 2001 IROC Results". Racing-Reference. Retrieved August 16, 2017. ^ "Dale Jarrett – 2002 IROC Results". Racing-Reference. Retrieved August 16, 2017. Moriarty, Frank (2001). Dale Jarrett. MetroBooks. ISBN 1-5866-3048-2. 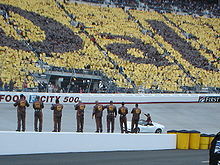 Wikimedia Commons has media related to Dale Jarrett.